He also has an expansive view of executive power and has favoured limits on investigating the president. 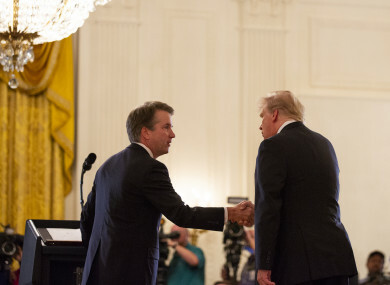 President Donald Trump shakes hands with Brett Kavanaugh, his Supreme Court nominee. PRESIDENT DONALD TRUMP last night chose Brett Kavanaugh, a solidly conservative, politically connected judge, for the Supreme Court, setting up a ferocious confirmation battle with Democrats as he seeks to shift the nation’s highest court ever further to the right. A favourite of the Republican legal establishment in Washington, Kavanaugh, 53, is a former law clerk for retiring Justice Anthony Kennedy. Like Trump’s first nominee last year, Justice Neil Gorsuch, Kavanaugh would be a young addition who could help remake the court for decades to come with rulings that could restrict abortion, expand gun rights and roll back key parts of Obamacare. With Kavanaugh, Trump is replacing a swing vote on the nine-member court with a staunch conservative. Kavanaugh, who serves on the Court of Appeals for the DC Circuit, is expected to be less receptive to abortion and gay rights than Kennedy was. He also has taken an expansive view of executive power and has favoured limits on investigating the president. A senior White House official said Trump made his final decision on the nomination Sunday evening, then phoned Kavanaugh to inform him. The official said Trump decided on Kavanaugh because of his large body of jurisprudence cited by other courts, describing him as a judge that other judges read. Trump phoned retiring Justice Kennedy to inform him that his former law clerk would be nominated to fill his seat. Trump signed Kavanaugh’s nomination papers yesterday evening in the White House residence. Top contenders had included federal appeals judges Raymond Kethledge, Amy Coney Barrett and Thomas Hardiman. Senate Majority Leader Mitch McConnell called Kavanaugh “a superb choice” and said senators would start meeting with him this week. Email “Trump picks Republican favourite for Supreme Court - setting up a ferocious confirmation battle”. Feedback on “Trump picks Republican favourite for Supreme Court - setting up a ferocious confirmation battle”.